The classic novel of luxury and depravity, now a major motion picture. From the author of the celebrated dystopian classics Kingdom Come, The Drowned World, and The Drought, High Rise is a prescient story of class warfare. 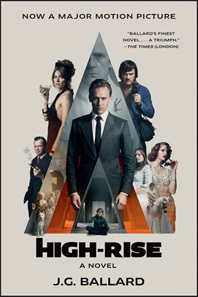 The film adaptation by acclaimed director Ben Wheatley (Sightseers, Kill List) features Academy Award® winner Jeremy Irons; BAFTA Award nominees Tom Hiddleston and Sienna Miller; Luke Evans and Golden Globe Award® winner Elisabeth Moss. When explosive loyalties form inside a luxurious apartment block isolated from the rest of society, modern elevators become fierce battlegrounds and cocktail parties degenerate into marauding attacks on “enemy” floors. In this chilling tale, humanity slips into violent reverse as once-peaceful residents, driven by primal urges, re-create a world ruled by the laws of the jungle. Sales Territory: USA and Dependencies and the Philippines.